Getting the most out of your boat refrigerator means being able to have the foods you want on board, having cold drinks, being able to find what’s in the refrigerator and use as little power as possible in the process. Somewhat counterintuitively, all that starts by taking some of the contents out. Bear with me for a minute. By knowing what doesn’t really have to be refrigerated and removing it, there will be more room for the things that do need to be kept cold, the cold air will circulate better and it’ll be much easier to organize and find the contents. In homes, we tend to refrigerate a lot of produce that does just as well unrefrigerated. There are a number of alternatives to dairy products, for example, that don’t require refrigeration until they are opened. Since these can take up a lot of space in the refrigerator, they are therefore prime candidates for removal. 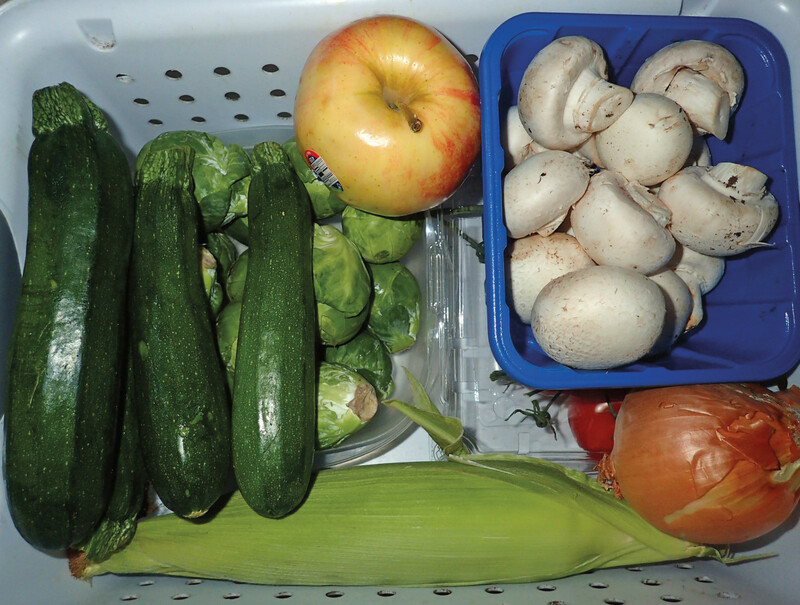 When it comes to storing unrefrigerated produce if possible buy vegetables and fruit that have never been refrigerated. Otherwise, lay them out to warm up and wipe off any condensation before storing them; items must be dry or they will rot. Be very picky when buying and don’t accept any with blemishes or bruises, as they will go bad much more quickly. Ventilated bins are great for most items. Create “darkness” by placing a dish towel or old T-shirt over the contents. Tomatoes: Buy them in varying stages of ripeness, including those that are still green. Either store them in a dark place, wrap them with paper towels or newspaper or stick them in tube socks—they need darkness to ripen. Unwrap when ripe and use within two days. By buying in various stages of ripeness, you can have a supply for two weeks or more. Carrots and Celery: Wrap these in aluminum foil, but don’t totally seal the packet. Instead, leave little openings at the end for moisture to escape. Otherwise, they’ll rot. They may dry out some, so rejuvenate in water. Both carrots and celery will easily last one week, often two weeks or more. Mushrooms: Place mushrooms one or two deep in a ventilated tray or bin and they’ll last up to a week, often longer than they last in a refrigerator. They may dry out a little but will remain every bit as good when cooked. Cabbage and Brussels Sprouts: Keep cool. Even in the tropics, cabbage will last several weeks as long as you protect it from bruising too much. Lettuce does not keep well even in the refrigerator, so cabbage becomes the “salad staple” for cruisers. Napa cabbage is a good alternative that’s closer to the texture of lettuce and will last at least a week. If the cut edge of either turns black, just trim it off. Brussels sprouts generally last a week without refrigeration. Squash and Zucchini: Small summer squashes last much better than larger ones and will keep 10 days or sometimes longer in bins. They don’t need any special treatment besides removing the plastic wrap. If they start to wilt, use them in a cooked dish instead of eating raw—you won’t notice that they’re not crisp. Hard squashes, like spaghetti and acorn squash, will last a month or more with no special treatment other than protecting them from bruising. Once cut, the entire squash must be used. Citrus Fruit: Oranges, grapefruit, lemons and limes all last several weeks to a month if you wrap each one individually in foil and protect them from bruising. Store away from other produce, as citrus will cause other fruits and vegetables to ripen and rot more quickly. Again, carrying enough milk for breakfasts and sour cream for happy hour dips takes up a lot of refrigerator space, which you’ll begrudge if you’re out for more than just a few days. Another bonus of using non-refrigerated alternatives is that you don’t have to worry about food going bad. Instead of trying to find space for multiple large cartons of milk, buy boxed UHT milk in Tetra Paks that only have to be refrigerated once opened. Boxed milk also usually comes in quarts, so it doesn’t take up much space even when it does go in the fridge. Boxed milk can sometimes be tough to locate in grocery stores, but most do carry it; it’s often in the Latin foods aisle or with baking supplies or coffee. Almond and soy milk are also sold in Tetra Paks. You can make your own sour cream from non-refrigerated ingredients by adding one or two teaspoons of white vinegar, lemon or lime juice to one 8-oz (250 ml) can of media crema (similar to half and half and sold in the Latin foods aisle of most groceries). Stir well, refrigerate for half an hour, then use as you would regular sour cream. Having less in the refrigerator alone will greatly improve things by making it easier to see what’s there and find the items you need. However, by taking just a few more simple steps you can improve the situation further still. The key is to have an organizational plan and always put the same categories of items in the same places. This, in turn, will both help you find items and reduce the time the fridge is open, greatly lessening the power required to run it. 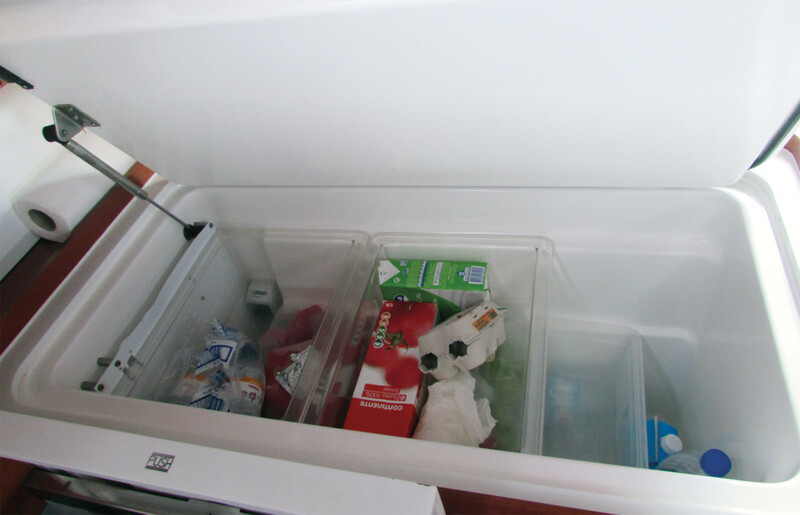 Getting cold drinks out, for example, is the reason behind the majority of times the refrigerator is opened on our boat. So we don’t just put “drinks” in one area, but go a step further and always put beer, water, sodas and iced tea in the same order, from left to right, and always put the warm ones in the back, so there’s never a doubt as to which are the coldest. Bins are almost imperative in large top-loading refrigerators since by using several layers of bins, it’s easy to remove the top ones to quickly get to items below. Bins will also help protect fragile items, such as greens and eggs. Keep drinks (and meats, if necessary) in the bottom layer where it’s coldest and produce on the top where it’s warmest and won’t have anything falling on top of it. Although I now have a front-loading refrigerator, I find that bins are still useful to keep like items together and organized so that I can get things out quickly and not lose any more cold air than absolutely necessary. Bins also make it easy to see if I’m getting low on something. I have a separate bin, or drawer for snacks, produce, eggs and medications. Drinks are in designated spots, as is everything else. Even leftovers are always put in the same place! My preference is bins with solid bottoms and ventilated sides, so that anything that spills is contained but cold air can still circulate. If you can’t find any the right size, get solid ones and then use a drill or Dremel tool to make ventilation holes. Using bins also helps when it comes time to defrost the refrigerator. You can simply remove the bins and put spare pillows and blankets over them to keep the contents cool. Frozen food goes into a cooler. Defrosting any time the frost gets over ¼in thick on the evaporation plates will significantly lessen the power used. Small boat refrigerators (particularly front-loading ones) are also subject to more temperature fluctuations than home refrigerators, as there is less cold mass and less cold air overall inside. For this reason, meat, poultry and seafood are best kept in the freezer (if there is no room in the freezer, put in the coldest part of the refrigerator, which is usually the lowest area). Before casting off, I remove the meat from any bulky packaging in may have come in, bone it if necessary and repack into packages that contain just enough for a single meal. Every day, I then remove that evening’s meat from the freezer and let it defrost in the refrigerator section. Once I refined how and where I kept everything, we could eat well with plenty of fresh meat and vegetables. Even with a tiny 3-cubic-foot refrigerator, we can easily go two weeks without a reprovisioning run. And that means that we get to spend more time in wonderful but out-of-the-way places!